It is the time of year when many are looking forward to vacation time. Have you considered that your constant companion, Jesus Christ, you Lord and Savior, wants to enjoy your leisure time with you? I am older and I am still learning about all the wonderful ways our precious Lord desires to fellowship with us even though I have been at this for years. I have a hunger for seeing more of our Lord’s handiwork all around us. Our ornamental pear tree blooms draw many kinds of bees. Some of them are really tiny and I wonder what their nest or hive might look like. I have never seen a humming bird nest and would dearly love to see one. As a Christian, my bucket list is unending and this is as it should be! Life should never be dull with Christ in our life. The world likes to cross off things on their bucket list of things to do and so do I; but, I am also looking forward to Heaven and all I will be able to do there. Please let me tell you some of what I have learned over the years about fun with Christ. My e book, America, Christ’s Top Nation Has Fallen, has a chapter Canoeing with God, that contains many stories about how Christ fellowships with us while enjoying His creation. Years ago, when I would see something nice, I started praising the Lord about what I saw with at least a simple thank you Lord for that. It seemed like the more I praised the Lord, the more I saw. So I guess it was kind of natural that when I took my small Sunday school class of teenage boys canoeing, I started praying that they would see a bald eagle even though up until that time, my wife and I had never seen one when frequently canoeing the same area; but, I knew they were sometimes seen in the area. So with about every stroke of my paddle I started praying, Lord, I want my boys to see a bald eagle and after awhile we were buzzed by a bald eagle. After that, I had the pleasure of taking a few church groups canoeing after they had prepared by praying that we would see bald eagles and we saw bald eagles! On a later trip, I challenged the people canoeing to ask the people fishing if they had seen bald eagles because by then I had talked to some people who fished the area regularly and learned they had never seen a bald eagle! Years of traveling and asking the Lord to show us his majesty in our morning devotions had resulted in awesome days enjoying nature in places like Yellowstone. On one trip to Yellowstone, my in-laws, my mother and daughter and my wife and I were all in our Volkswagen camper for morning devotions. I asked that we see specific things in that mornings devotion and at afternoon and evening prayers at meal time and each segment of that day we did see what we had prayed for and more! I am still amazed that what follows occurred (in 2008). I have been thinking about it lately and I need to tell you about it. My wife and I were circling the Cades Cove area of Smoky Mountain National Park one evening, when we encountered slow traffic and then a lot of parked cars. I quickly slid our small motor home into the parking spot that kind of miraculous appeared among all those cars and we set out to see what was going on ahead. We found a crowd of people standing on the top of a hill watching a bear and two yearling cubs way down below. The Lord clearly informed me that you can approach this bear, so I told my wife, I am going to walk down and get a picture of this bear. I walked down the hill and when I got near the bear, I sat down and waited for a good picture and I marveled at how unafraid I was. The only escape was uphill and I can’t even run downhill! While I sat there, a nervous young man joined me but he didn’t stay long. I think he left about the time the mother bear stood up and mouthed a warning to the cubs which were a little ways off. 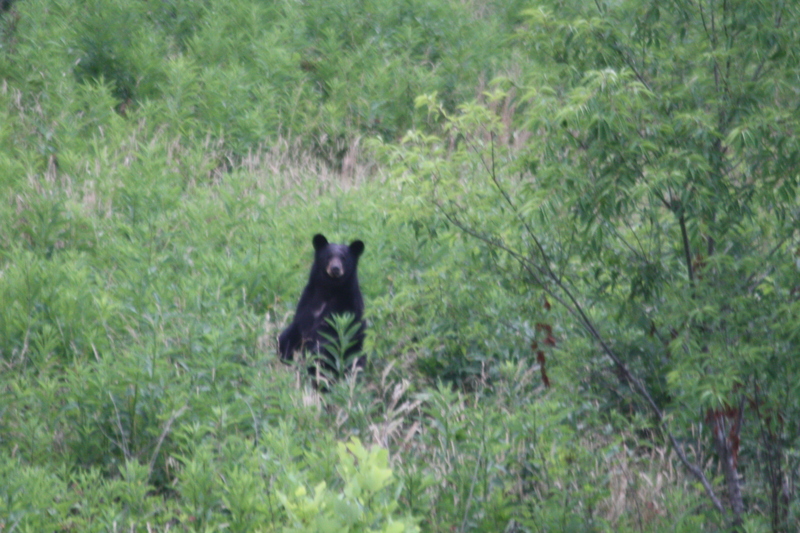 When the bear came close and stood up, I snapped a picture of her under a small tree and another of her sitting up-right a bit later as she watched me awhile from a more open area. This is the picture above. Sorry, it was near dark and the picture focus reflects that. After the picture was taken, she returned to grazing and ignored me. Later, I thought, why didn’t I pray that the Lord would bring the bears nearer! I was able to get two other guys in a church group to pray with me that a hump back whale would come to our boat on a whale watching trip in Hawaii and it worked but that is another story. Years ago, while living in the Allegheny Mountains, a woman I worked with and I were talking about nature and she said she and her husband had never seen a bear. I told her to pray that they see a bear the next time they took a scenic drive and the next day she excitedly told me about the bear they had seen that evening. The same Lord who tracks your every tear (Psalm 56:8) and tracks your every hair (Luke 12:7) longs to share your leisure time. To us devout Christians, shouldn’t that be a no brainer!